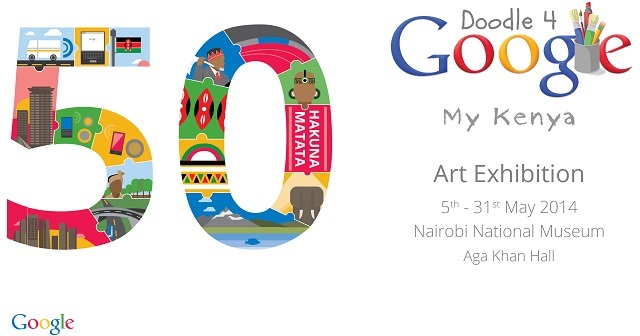 Google has an ongoing exhibition in Kenya in celebration of the 50th year anniversary of independent Kenya. The exhibition features the top 100 doodles from the recent Doodle 4 Google competition that was conducted in over 30 countries worldwide. Doodle 4 Google sought to have students reinvent the Google homepage logo. The Kenya version of Doodle 4 Google had 5000 submissions from artists aged between ages 6-18 years in what was a competition to celebrate the monumental year in Kenya with recent national elections and the Jubilee year. The winning logo was won by 17 year old Esther Wambui Githinji with a doodle titled “Feet of Gold” and this was featured on the Google Kenya homepage on Mashujaa Day, 20th October. The art exhibition is currently set up at the Nairobi National Museum, Aga Khan Hall from dates 5th- 31st of May. Plus there are no entry charges to the exhibition. Just the initial Museum charge which is 200Kshs only.